Meanwhile, up-north in Israel, there's a sub plot featuring Jezebel (King Ahab’s wife and Queen... and possibly (according to masoretic text) the mother of Athaliah, who according to some sources was a King of Judah (having slipped in between the reigns of Ahaziah/Jehoshaphat and Joash/Jehoash). Athaliah, however, was not in the lines of descent... sort of a four year space marker. [c.843-839 BCE] We will ignore him. Or her. Other sources, for example, describe Athaliah as a daughter or sister of Ahab. As a daughter, Athaliah would have also been the daughter of Jezebel. The alternative version in the story of Jezebel is that her name was altered by adding a letter -- changing the name’s meaning from "Virgin of Baal", to "Whore of Baal". Feminists see Jezebel as a strong and assertive woman, who was attacked and finally murdered by the fanatic male representatives of a male-dominated religion, and whose memory was continually vilified for thousands of years for the same reason — i.e. "because she was a strong and independent woman who did not let men dominate her, and who continued to defy the aggressive males to her last breath.” Secularists and atheists sometimes take Jezebel's side, as the victim of aggressive religious fanatics who did not hesitate to resort killing in order to enforce their point of view. Isaac Asimov, an outspoken atheist, but who was raised as a Jew, included Jezebel in one of his novels. The main character saw Jezebel as an ideal wife and a woman who, in full compliance with the mores of the time, promoted her own religion in a conscientious fashion. For the historian, the story of Ahab and Jezebel gives a detailed account of an intense religious-political struggle — the most detailed of any period in the history of the Kingdom of Israel -- but written from a highly partisan point of view, and with no surviving documents that represent the other side of the controversy. Moreover, the account is mainly interested in the religious side of the events, with the political, economic and social background — highly important to modern historians — given only incidentally. Obviously, Ahab's marriage to Jezebel was - at least to begin with - a dynastic marriage intended to cement a Phoenician alliance going back to the times of Solomon. This alliance gave the inland Kingdom of Israel all-important access to international trade. The monarchy (and possibly an urban elite connected with it) enjoyed the wealth derived from this trade, which gave it a stronger position vis-a-vis the rural landowners, and made for a more centralized and powerful monarchical administration. Unfortunately, Jezebel, with her foreign religion and cosmopolitan culture, represented a hated Phoenician alliance from which the landowners had little to gain and much to lose. Their secular resentment was expressed in religious terms (as in many other times and places), and eventually got a political expression in Jehu’s bloody coup, instigated and supported by the prophets whose side of the story the Bible preserves. One view of Jezebel is that she simply did not accept Ahab's God, Yahweh. Rather, she led Ahab to tolerate Baal. This is why she was vilified by the Deuteronomist, whose goal was to stamp out polytheism. She represented a view of womanhood that was opposite of those extolled in such characters as Ruth the Moabite, also a foreigner. Ruth surrenders her identity and submerges herself in Israelite ways; she adopts their religious and social norms and is universally praised for her conversion to God [an approved gold digger]. Jezebel steadfastly remains true to her beliefs [an unapproved Queen]. Ahaziah was king of Judah, and the son of Jehoram of Judah and Athaliah, the daughter (or possibly sister) of King Ahab of Israel. He is also called Jehoahaz. His son was Joash. Ahaziah joined his uncle Jehoram, King of Israel, in an unsuccessful expedition against Hazael, king of the Arameans. Jehoram was wounded in the battle, and when Ahaziah went to visit his uncle at Jezreel, he was caught up in the revolt of Jehu; Ahaziah fled for his life, but was wounded at the pass of Gur, and had strength only to reach Megiddo, where he died. He is said to have reigned only one year. It is not clear if Jehu killed two kings (as the Bible says) or Hazael. 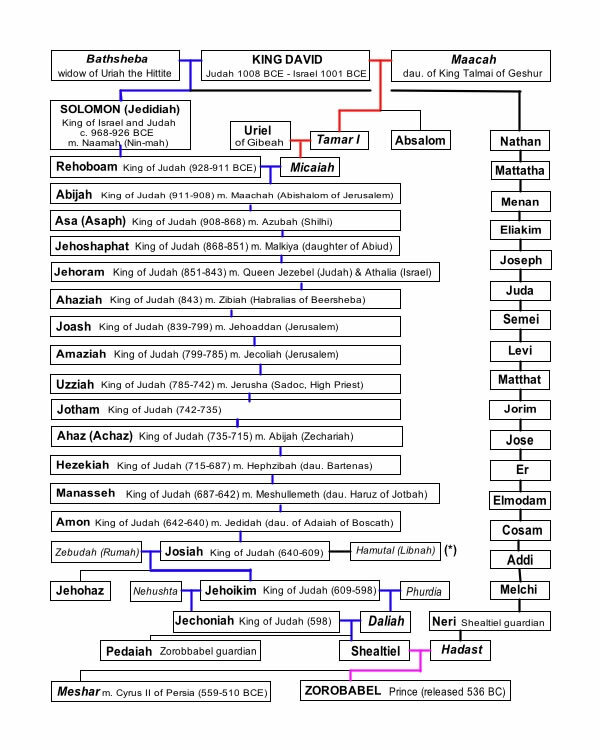 NOTE: Wikipedia's version shows Ahaziah as son of Jehoram and Athaliah... and as son of Ahab and Jezebel (the latter making Athaliah as possibly his sister). There are also two Jehoahaz's and two Jehoash's. Apparently, things were just a bit confused at the time. During the following seven years, Athaliah (the daughter of Jezebel and wife of Jehoram of Judah) -- and the woman who had commanded the general massacre of Jehoram and Joash’s families -- ruled Judah instead of the unknown Joash. [As a daughter of Jezebel, it might be suspected that Athaliah was gaining revenge against ALL of the male descendants of David... ostensibly because of David’s priestly transgressions (killings)... but more likely because of Jezebel’s more ecumenical attitude.] Then Joash’s great-uncle, the high priest Jehoiada, brought him forth to public notice when he was seven years of age, and had Joash (Jehoash) crowned and anointed king. Athaliah was taken by surprise when she heard the shout of the people, "Long live the king" [Really? ]; and when she appeared in the temple to challenge this coup, Jehoiada commanded her to be led forth out of the Temple to be put to death. This period of history in Israel and Judah illustrates the continual battle between the priests and the somewhat more secular heads of state... a battle surviving in many areas to modern times. Meanwhile, back at the High Priest Zohoiada’s coup, and despite the fact that a king -- who is the son of a king -- need not be anointed, an exception was made in the case of Joash. It was similar to the same anointing of Solomon and Zedekiah, the succession of each being contested. Particular mention is made of the crown placed on Joash's head, and because it fitted exactly, showed that he was qualified for kingship. [It doesn’t take much to claim all manner of royalty.] While the High Priest lived, Jehoash favored the worship of God and observed the Law; but on his death Jehoash was led into supporting other gods; Zechariah, the son and successor of the High Priest, was put to death. For these deeds, Joash allegedly brought down on the land the judgment of God [AGAIN? ], and Judah was oppressed by the Aramean invaders. Joash is one of the four kings omitted by Matthew (1:8) in the genealogy of Jesus, along with Ahaziah, Amaziah, and Jehoiakim. His killing of Zechariah ben Jehoiada is referred to in Matthew 23:35. When the Syrian king Hazael marched against Jerusalem, Joash bribed him with the gold of the royal and sacred treasuries to turn back; this proved fruitless for the Syrian army persisted to destroy all the princes of Judah and the soldiers "executed judgment against Joash," and they left him severely wounded. Joash was assassinated by his own servants at Beth-milo, after a reign of forty years, and his assassination is recorded as an act of revenge for the blood of Zechariah... after forty years? Joash was one of the four men who pretended to be gods. He was persuaded thereto particularly by the princes, who said to him. "Wert thou not a god thou couldst not come out alive from the Holy of Holies". [This might also explain why he was one of those omitted by Matthew’s genealogy of Jesus!] He was assassinated by two of his servants, one of whom was a son of an Ammonite woman and the other the offspring of a Moabite; for God said: "Let the descendants of the two ungrateful families chastise the ungrateful Joash". Amaziah ("the strength of the Lord" or "strengthened by Jehovah" or "Yahweh is mighty") was the son/successor of Joash. taking the throne at the age of 25 and reigning from 797 to 767 BC. He began his reign by punishing the murderers of his father. He was the first to employ a mercenary army of 100,000 Israelite soldiers, which he did in his attempt to bring the Edomites again under the yoke of Judah. He was commanded by an unnamed prophet to send back the mercenaries, a command to which he acquiesced, much to the annoyance of the mercenaries. [It’s generally considered poor form to needlessly annoy hired mercenaries.] His obedience to this command was followed by a decisive victory over the Edomites. Nevertheless, Amaziah began to worship some of the idols he took from the Edomites, which the author of Chronicles believes led to his ruin and his defeat by Jehoash, king of Israel whom he had challenged to battle. His defeat was followed by a conspiracy that took his life. He was slain at Lachish, to which he had fled. He was buried in the royal sepulchre in Jerusalem. Uzziah was the king of the ancient Kingdom of Judah, and one of Amaziah's sons, whom the people appointed to replace his father. He first became co-regent with Amaziah (c. 792 BC), with his sole reign begriming c. 768 BC. He was struck with leprosy (c. 750 BC), and his son Jotham took over the government. Uzziah died c. 740 BC. He had taken the throne at the age of sixteen. His long reign of about fifty-two years was "the most prosperous excepting that of Jehoshaphat since the time of Solomon." He was a vigorous and able ruler, and "his name spread abroad, even to the entering in of Egypt". In the earlier part of his reign, under the influence of a prophet named Zechariah, he was faithful to Yahweh, and "did that which was right in the sight of the Lord". [Sound familiar?] In Jerusalem he made machines designed by skillful men for use on the towers and on the corner defenses to shoot arrows and hurl large stones. His fame spread far and wide, as he became powerful. But then, his pride led to his downfall. [Or maybe it had nothing to do with pride.] He entered the temple to burn incense on the altar of incense. Azariah the High Priest saw the tendency of such a daring act on the part of the king, and with a band of eighty priests he withstood him, saying, "It appertaineth not unto thee, Uzziah, to burn incense." [I.e., it’s not in your job description. This bit is ours!] Abruptly a great earthquake shook the ground and a rent was made in the temple, and the bright rays of the sun shone through it, and fell upon the king's face, insomuch that the leprosy seized upon him immediately. Accordingly he was driven from the Temple and compelled to reside in "a separate house" until his death. The government was turned over to his son Jotham, indicating a co-regency that lasted for the last 11 years of Uzziah's life. He was buried in a separate grave "in the field of the burial which belonged to the kings". "That lonely grave in the royal necropolis was designed to eloquently testify to coming generations that all earthly monarchy must bow before the inviolable order of the divine will [as interpreted by the priests], and that no interference could be tolerated with that unfolding of God’s [and/or the High priest’s various and nefarious] purposes. This inconsistency in dates is based on part in accepting that the beginning of the Uzziah/Jotham co-regency began sometime in the six-month period after Nisan 1 of 750 BC. Some writers object to the use of co-regencies in determining the dates of the kings of Judah and Israel, saying that there should be explicit reference to co-regencies if they existed. Since there is no word for "co-regency" in Biblical Hebrew, an explicit mention using this word will never be found. In the case of Uzziah, however, the statement that after he was stricken with leprosy, his son Jotham had charge of the palace and governed the people of the land is a fairly straightforward indication of what in modern terms is called a co-regency. Co-regencies are well attested in Egypt, and an interesting fact is that the pharaohs, in giving the year of their reign, never relate whether it is measured from a co-regency. Egyptologists must determine the existence of a co-regency from a comparison of chronological data. Not all of the co-regencies for the kings of Judah and Israel are as easy to identify as the Uzziah/Jotham co-regency, but those who ignore co-regencies in constructing the history of this time have failed to produce any chronology for the period that has found widespread acceptance. After noting how David set a pattern by setting his son Solomon on the throne before his death, one might dare to conclude that dating the co-regencies accurately is indeed the key for solving the problems of biblical chronology in the eighth century B.C. Jotham ("God is perfect or complete") was the king of Judah, and son of Uzziah with Jerusha, daughter of a High Priest, i.e., Zadok. Jotham took the throne at the age of twenty-five. (c. 742 – 735 BC; with his co-regency with Uzziah beginning c. 750 BC) Jotham was deposed by the pro-Assyrian faction in favor of Jotham’s son Ahaz. Jotham died c. 731 BC. His father Uzziah was afflicted with tzaraas (leprosy) [allegedly (but almost certainly not)] when he entered the Temple to burn incense. Jotham became governor of the palace and the land at that time, i.e., co-regent, while his father lived in a separate house as a leper. Jotham fought wars against Rezin, king of the Arameans, and Pekah, king of Israel. There is an account of his victory over the Ammonites, which resulted in the Ammonites paying him tribute of 100 talents of silver, and 10,000 kors each of wheat and barley. He was contemporary with the prophets Isaiah, Hosea, Amos, and Micah, by whose advice he may have benefited. Much more significantly was the growing threat from Assyria that both the kingdoms of Israel and Judah faced. The Assyrian, Tiglath-Pileser III, warred against Arpad in the years 743 to 740 BC, capturing the city after three years. In face of this threat, Rezin of Damascus made an alliance with Pekah of Israel, and the two were therefore enemies of the both the Assyrians and the pro-Assyrian king of Judah, Ahaz. Meanwhile Menahem, ruling in Samaria, sent tribute to Tiglath-Pileser in order to ally himself against his anti-Assyrian rival Pekah. The growing Assyrian pressure strengthened the hand of those who sought to accommodate to the enemy from the north. When (c. 736/735 BCE) Tiglath-pileser was again in the northwest, many in Judah assumed that the time had come to submit or be crushed. It is likely that a pro-Assyrian group felt itself strong enough to force the anti-Assyrian Jotham into retirement and to place the pro-Assyrian Ahaz on the throne. Although Jotham continued to live to his twentieth year, it was Ahaz who directed affairs from 735 BCE. Ahaz ("has held", an abbreviation of Jehoahaz, "God has held") was king of Judah, and the son and [eventual] successor of Jotham. (c. 735-7125 BC) He is said to have given himself up to a life of wickedness, introducing many pagan and idolatrous customs... [possibly in connection with his being pro-Assyrian, i.e., saving his nation’s hindquarters]. Perhaps his wickedest deed was sacrificing his own son, likely to Rimmon [and thus unlike Abraham’s intent with his son?]. Ahaz also added an idolatrous altar into the Temple. He ignored the remonstrates and warnings of the prophets Isaiah, Hosea, and Micah, and appealed to Tiglath-Pileser III, the king of Assyria, for help against Rezin, king of Aram, and Pekah, Prince of Israel, who threatened Jerusalem. He died at the age of 36 after reigning 16 years, and was succeeded by his son Hezekiah. Because of his alleged wickedness he was "not brought into the sepulchre of the kings". An insight into Ahaz's “neglect of the worship of the Lord” is found in the statement that on the first day of the month of Nisan that followed Ahaz's death, his son Hezekiah commissioned the priests and Levites to open and repair the doors of the Temple and to remove the defilements of the sanctuary, a task which took 16 days. Between the death of Sargon II, and the succession of his son Sennacherib, Hezekiah sought to throw off his subservience to the Assyrian kings. He ceased to pay the tribute imposed on his father, and "rebelled against the king of Assyria, and served him not," but entered into a league with Egypt. This led to the invasion of Judah by Sennacherib in the 4th year of Sennacherib. The invasion of Judah by Sennacherib and the Assyrian army was a major deal in the history of Judah. Sennacherib recorded on his monumental inscription, "The Prism of Sennacherib", how in his campaign against Hezekiah, he took 46 cities in this campaign, and besieged Jerusalem ("Ur-sa-li-im-mu") with earthworks. It was during the siege of Jerusalem that the Bible says the Angel of the Lord killed 185,000 Assyrian soldiers. Herodotus wrote of the invasion and acknowledges many Assyrian deaths, which he claims were the result of a plague of mice. The Assyrians, on the other hand, claimed that Sennacherib raised his siege of Jerusalem after Hezekiah acknowledged Sennacherib as his overlord and paid him tribute. Curiously, the Bible does indeed record that eventually Hezekiah saw Sennacherib's determination, and offered to pay him three hundred talents of silver and thirty of gold in tribute, even despoiling the doors of the Temple to produce the promised amount. Nevertheless, in a true revisionist-history manner, the Biblical account maintains that Hezekiah anticipated the Assyrian invasion and made at least one major preparation called Hezekiah's tunnel, which is more commonly known as the Siloam Tunnel. It is 533 meters long and was dug in order to provide Jerusalem underground access to the waters of the Spring of Gihon/The Siloam Pool, which lay outside the city. At the same time a wall was built around the Pool of Siloam, into which the waters from the spring flowed and which was where all the spring waters were channeled. The wall surrounded the entire city, which bored up to Mount Zion. An impressive vestige of this structure is the broad wall in the Jewish Quarter of the Old City of Jerusalem. "When Hezekiah saw that Sennacherib had come, intent on making war against Jerusalem, he consulted with his officers and warriors about stopping the flow of the springs outside the city ... for otherwise, they thought, the King of Assyria would come and find water in abundance" (2 Chronicles 32:2-4). Meanwhile, the death of Sennacherib came about as he was worshiping in the house of Nisroch his god, that Adrammelech and Sharezer killed him with the sword; and they escaped into the land of Ararat.. Esarhaddon his son became king in his place. The Bible does not say when this took place, but Assyrian records show that Sennacherib was assassinated by his sons, Adrammelech and Sharezer, in 681 BC - i.e., twenty years after the invasion of Judah in 701 BC. He was succeeded by Esarhaddon as the Assyrian king. King Hezekiah is believed to have introduced substantial religious reforms. There is, however, evidence from archaeology that suggests he allowed, and indeed built temples at Lachish and Arad, and allowed a high place to continue in operation at Beersheba. The statements of his righteous actions may be "simply Deuteronomistic propaganda". Far from being a Canaanite goddess, the Kuntillet Arjud and Khirbet el-Qom both speak of Yahweh and his Asherah (the latter the prime goddess of Judah/Israel). Manasseh was a king of the Kingdom of Judah, the only son and successor of Hezekiah [and Isaiah's daughter]. He was co-regent with Hezekiah (697-687) and reigned solely (687-642) until his death. He was married to Meshullemeth, daughter of Haruz of Jotbah, and they had a son Amon, who succeeded him as king of Judah upon his death. Manasseh was the first king of Judah who would not have had a direct experience of a Kingdom of Israel, which had been destroyed by the Assyrians in c. 720 BC and its population deported. He is mentioned in Assyrian records as a contemporary of Esarhaddon. His reign of 55 years (10 of which he was co-regent with his father), is the longest in the history of Judah. Manasseh allegedly reversed the religious reforms of his father Hezekiah (or possibly simply continued his father’s work), reinstating pagan worship in the Temple, for which he is naturally condemned. He built altars to pagan gods all over Israel, his reign described as reactionary in relation to his father's; he may even have executed supporters of his father's reforms. One tradition tells that Manasseh was taken captive to Babylon by the king of Assyria, Esarhaddon. Such captive kings were usually treated with great cruelty. They were brought before the conqueror with a hook or ring passed through their lips or their jaws, having a cord attached to it, by which they were led. The severity of Manasseh's imprisonment may have brought him to repentance. [Or else wishful thinking on the part of the High Priest.] According to the Biblical account, God heard his cry, and he was restored to his kingdom. He abandoned his idolatrous ways, and enjoined the people to worship HaShem, although there was no reformation. Amon [shades of Egypt!] was the king of Judah (c. 642-640 BC) He did manage before dying to marry Jedidah, the daughter of Adaiah of Bozkath. He also continued his father's practice of idolatry, and set up the images as his father had done. His reign was marked by moral depravity. [Cool!] He was assassinated by his servants, who conspired against him [and who had obviously formed a Servants’ Union]. Amon was succeeded by his son Josiah, who was eight years old. Josiah ("supported of the Lord") (c. 649-609 BC) was a king of Judah (641-609 BC), the son of Amon. Josiah may have instituted major reforms, and is credited by some historians with having established or discovered [aka created out of thin air for PR purposes] important Jewish scriptures during the Deuteronomic reform that occurred during his rule. Actually, we might note in passing that virtually every king of Judah and/or Israel eventually (sooner or later) ends up on the wrong side of the priests. In some venues this realization of the extreme negativity of even having priests around... is called “growing up”. This is because, in part, the priests attribute every misfortune of Israel/Judah to a king not going along with the extreme radicals of the religious hierarchy. On the other hand, when times are prosperous and peaceful, it’s supposedly because the king is righteous... or to put it more accurately, in the employ (or at the beck and call) of the priests. [Remember Akhenaten?] An idea somewhat more connected to reality would be that there are good times and bad times, regardless of the deeds of kings -- and the priests of whatever hierarchy don’t have a clue, have no connections, and are opportunists at best... and therefore their interpretations of calamities... are irrelevant. Curiously, the “YHWH’ (which became an eventual acronym for the One God)... “Y represented El the Father, H was Ashtoreth the Mother, W corresponded to the Son, Baal and H was the Daughter, Anath. Ashtoreth (Lady Asherah of the Sea, Progenitress of the Gods) was often referred to as Elath and was said to have had seventy offspring by El-Jehovah, including Baal, Anath and their brothers Mot and Yamn.” [Ashtoreth seems to have a lot in common with Tiamat... while Baal could be another name for Jesus] In roughly 1060 BCE, it was reported that ‘the children of Israel did put away Baal and Ashtoreth, and served the Lord only.’ But as noted in 1 Kings 11:5, King Solomon worshipped Ashtoreth and the Holy of Holies was deemed to represent the womb of the divine Mother. “As the supreme consort of El-Jehovah, Ashtoreth was an integral part of religious life in Judah until the reforms of King Josiah (2 Kings 23) at the time of the Babylonian invasion." Meanwhile, back at the Hebrew Pro-Defamation League for the defaming of all goddesses, other gods, and the world in general, Josiah was having all living pagan priests executed. Josiah even went to the bother of having the bones of dead pagan priests exhumed from their graves and burned on their altars... which was viewed as an extreme act of desecration against the pagan deities by their adherents [and by observers as a prime example of overkill]. Josiah even destroyed altars and images of pagan deities in cities of the tribes of Manasseh, Ephraim, "and Simeon, as far as Naphtali", which were outside of Judah. Josiah ordered the High Priest Hilkiah to use the tax monies which had been collected over the years to repair the neglect and damage suffered by the Temple during the reigns of Amon and Manasseh. [Curiously...] it was during this time that Hilkiah discovered the Book of the Law. Some modern critics speculate that the book was a forged by the priests in order to centralize power under Josiah. Other scholars disagree, arguing that a priestly forgery was unlikely, as the text itself placed restrictions on the privileges of the priestly class, who were actually a thorn in the side of King Josiah. Nevertheless, modern scholars who do not believe that these laws were a revelation of God to Moses, and that instead, assume that this Deuteronomy was forged by Josiah's priests, and that the core narrative from Genesis to 2 Kings up to Josiah's reign comprise a "Deuteronomistic History" that was written during Josiah's reign... [and using every artifice to push a very narrow agenda]. In the spring of 609 BC, Pharaoh Necho II personally led a sizable force to help the Assyrians. At the head of a large army, consisting mainly of his mercenaries, Necho took the coast route Via Maris into Syria, supported by his Mediterranean fleet along the shore, and proceeding through the low tracts of Philistia and Sharon. He prepared to cross the ridge of hills which shuts in on the south the great Jezreel Valley, but here he found his passage blocked by the Judean army led by Josiah. Josiah had sided with the Babylonians and attempted to block the advance at Megiddo. A fierce battle was fought and Josiah was killed. Necho then joined forces with Ashur-uballit (Assyrians) and together crossed the Euphrates and laid siege to Harran. Necho failed to capture the city, however, and retreated back to northern Syria. Nevertheless, the Assyrian Empire soon collapsed. Leaving a sizable force behind, Necho returned to Egypt. On his return, he found the Judeans had selected Jehoahaz to succeed his father Josiah, whom Necho deposed and replaced with Jehoiakim. He brought Jehoahaz back to Egypt as his prisoner, where Jehoahaz ended his days. The Book of 2 Chronicles 35:20-27 gives a lengthier account and states that King Josiah was fatally wounded by Egyptian archers and was brought back to Jerusalem to die. His death was a result of "not listen[ing] to what Necho had said at God's command..." when Necho stated: "What quarrel is there between you and me, O king of Judah? It is not you I am attacking at this time, but the house with which I am at war. God has told me to hurry; so stop opposing God, who is with me, or he will destroy you." Josiah did not heed this warning and by both accounts his death was caused by meeting Necho at Megiddo. Jeremiah wrote a lament for Josiah's passing, which is stated in Lamentations 4. Necho had left Egypt in 609 BC for two reasons: one was to relieve the Babylonian siege of Harran, and the other was to help the king of Assyria, who was defeated by the Babylonians at Carchemish. Josiah's actions suggest that Josiah was aiding the Babylonians by engaging the Egyptian army. Subsequent kings undid many of Josiah's reforms and re-instituted polytheistic religion. Judah was eventually destroyed by the Babylonians he had attempted to ally with, and the Hebrew people were sent into exile. Josiah rather obviously had been backing the wrong horse... and/or god. Jehoikim ("he whom Jehovah has set up" [I kid you not!]) (c. 634-598 BC, reign 609-598 BC) was king of Judah. He was the second son of king Josiah by Zebidah the daughter of Pedaiah of Rumah. His birth name was Eliakim. He succeeded his younger brother Jehoahaz (who Pharaoh Necho has deposed and carted off to Egypt where Jehoahaz died). Jehoiakim ruled originally as a vassal of the Egyptians, paying a heavy tribute. He is known for burning the manuscript of one of the prophecies of Jeremiah. Jeremiah had criticized the king's policies, insisting on repentance and strict adherence to the law. Another prophet, Uriah ben Shemaiah, proclaimed a similar message and was executed on the orders of the king. Jeremiah was spared from this fate, perhaps because he was well-connected. Jechoniah ("God will fortify (his people)") was a king of Judah. He was the son of Jehoiakim with Nehushta, the daughter of Elnathan of Jerusalem and was a contemporary of the prophets Jeremiah and Ezekiel. Jeconiah reigned three months and ten days to 598/597 BC. At 8 years of age, he had become king upon the death of his father, Jehoiakim, the latter only eighteen. Jeconiah was deposed by the Babylonians at the end of the first siege of Jerusalem by Nebuchadnezzar II in 597 BC, when the king, his household, and many of the elite and craftsmen of Judah were exiled to Babylon. Jeconiah was succeeded as king of Judah by his uncle Zedekiah, while Jeconiah was compelled to remain in Babylon, where he was regarded by the Jews in Babylon as the legitimate king of Judah and later would be regarded as the first of the exilarchs. Babylonian cuneiform records dated to 592 BC mention Jeconiah ("Ia-'-ú-kinu") and his five sons as recipients of food rations in Babylon. Dates in the book of Ezekiel are given according to the year of captivity of Jeconiah, and Ezekiel never mentions by name his successor, Zedekiah. Jeconiah was released from prison in the year that Amel-Marduk (Evil-Merodach) came to the throne, that is, in his accession year. Babylonian records show that Amel-Marduk began his reign in October 562 BC. Jeconiah was released from prison in the 27th day of the twelfth month of this accession year, i.e. in the spring of 561 BC. In Hebrew, the name Shealtiel means, "I asked El (for this child)". The name acknowledges that the son is an answer to the parents' prayer to God (El) to help them conceive and birth a child, thereby expressing the importance of, difficulty of, and thankfulness for a successful pregnancy. The Neo-Babylonian King Nebuchadnezzar II exiled to Babylon Jeconiah and his uncle King Zedekiah, the last two kings of Judah. Potentially, Shealtiel would become an heir to the throne, if the Davidic dynasty were restored. Meanwhile, the Hebrew Bible calls Shealtiel the second son of King Jeconiah. Another son, Pedaiah became guardian for Shealtiel’s [alleged] son, Zorobabbel (Zerubbabel). There is some confusion about whether Shealtiel is the biological father of Zerubbabel. Nevertheless several Biblical texts use the phrase "Zerubbabel the son of Shealtiel", perhaps to emphasize Zerubbabel's inheritance of Shealtiel's royal claim to the throne, if the Davidic throne were restored to Judah. The genealogy tables of the Gospels agree with the Hebrew Biblical texts that declare Shealtiel (not Pedaiah) as the father of Zerubbabel... Pedaiah being instead called the “Guardian of Zorobabbel in Babylon”. According to some sources, Shealtiel appears to have died childless, despite the fact he had reached manhood and married a wife. By this reckoning, Jehoiakim’s blood line would have come to an end with his grandson, Shealtiel. However, Jehoiakim’s son, Jechoniah, appears to have had another son by a widow of the royal line. By this marriage, the two boys, sons of the same mother, would become brothers by Jewish custom. Thus, the actual title to the throne remained active. As it happens, the curse of Jeremiah 36:30 was to be fulfilled not by the removal of the title itself from Jehoiakim's line but by the denial of that title to anyone who happened to be a blood relative in the line. With the death of Shealtiel this blood line terminated. But now, to the rescue rode Jewish custom, specifically as set forth in the principle of the Levirate (Deut. 25:5,6). Accordingly, it became incumbent upon Pedaiah, the deceased Shealtiel's (step) brother, to take Shealtiel’s widow and raise up seed through her who would therefore not be of Shealtiel's blood line, but would be constituted legally as Shealtiel's son through whom the title would pass to his descendants. The son of this Levirate union was Zerubbabel. An alternative version is that Pedaiah was simply Shealtiel’s brother, both having the same father and mother. However, this is not nearly as much fun as watching Jewish law find a loophole that keeps alive a bloodline, when in fact the physical evidence lacks merit. Still... Pedaiah’s heritage -- even if not as the son of Jechoniah -- would undoubtedly be able to trace itself back into the bloodline of a common ancestor of Shealtiel and Pedaiah. In other words, the blood royal lives, but the precise kingly succession requires Jewish law to claim specific legitimacy. Meanwhile, in Matthew 1:12 and Luke 3:27, Zerubbabel is listed legally as Shealtiel's son... whereas in 1 Chronicles 3:19 he is listed as the son of Pedaiah by actual blood relationship. In the terms of biblical reckoning these two statements are in no sense contradictory [despite appearances, logic, and reason]. We might wish to be more precise by substituting such extended terms of relationship as son-in-law, stepson, and so forth. But Scripture is not required to adopt our particular terminology. It is required only to be consistent with itself, and the facts of the case as recorded of those who were the actors in the drama are precisely as stated. We thus have a remarkable chain of events. Jehoiakim has a son, Jechoniah, who has a son, Shealtiel, who by Levirate custom has a son named Zerubbabel. This son, Zerubbabel, supposedly has no blood line connection whatever with Jechoniah, for he has no blood relationship with Shealtiel. The blood relationship of Zerubbabel is with Pedaiah, and through Pedaiah with Pedaiah's mother, and through this mother with Neri. Thus Neri begat a grandson, Shealtiel, through his daughter; (Hadast) and Shealtiel "begets" a son, Zerubbabel, through Pedaiah. The blood line thus passes through Zerubbabel -- but so does the title also. The bloodline passes via Pedaiah's mother, the title passes through Shealtiel's father. And though this mother and this father were also man and wife, the particular blood line (shown in blue in Figure 1) stopped with Shealtiel who literally died childless. It is necessary to emphasize this word literally, for it appears it was literally true. Jeremiah 22:30 had predicted that Jechoniah would also die "childless" -- but we are reasonably sure that this was not literally the case, for he had a son Shealtiel whom we cannot otherwise account for. Genealogy is obviously a matter of faith, as well as genetics. Robert Hendrickson, Word and Phrase Origins, Checkmark Books, 2000.